Guest blogger Cameron How explains the intention of his Lifetime Speech in the brief video linked below. 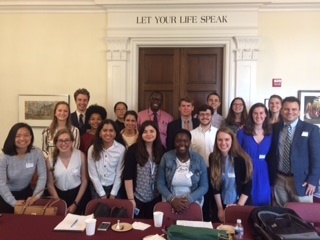 Students enrolled in the W&M DC Summer Institute on Leadership and Community Engagement were assigned to give an interpretation of the intended learning outcomes of the class. Students were expected to reflect on personal gifts for leadership, to humbly critique leaders skillsets with leadership theories and class readings and to practice communicating their emerging/evolving philosophy of leadership. Cameron wrote the speech as though he’d recently died with the following as his introduction, having been read to the class by one of his classmates. While I am saddened to be speaking to you today, so shortly after Cameron’s death. It is necessary that we take time to commemorate the life of the leader, mentor, husband, father, and friend we all held so close to our hearts. Cameron embodied what it means to be a leader. He set the precedent for those he worked with, with his admirable work ethic and ability to align his actions with his values. He never asked others to do anything that he wouldn’t do himself. Cameron ignited the passion of others, inspiring commitment to a shared vision and a shared set of guiding values. He modeled the way because he knew who he was, and others knew what he stood for. 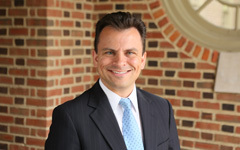 Cameron fostered collaboration among those who worked for him by building trust and facilitating relationships. He had a knack for engaging others in dialogue that mattered to build common understanding. Thus, Cameron created a culture that uplifted the spirit of the community. Cameron exuded a sense of emotional maturity while maintaining a playful spirit. At his core Cameron was passionately curious. And this curiosity led Cameron to develop the character, humility and grace which allowed him to draw out the best in others and the best in himself. That is what it means to be a leader, and that is why we will all remember Cameron’s legacy. I wish I could be there with them. That way I could share the real story. In the eyes of others, my life was the epitome of success. The public eye loved me. I was said to exemplify everything it is to be a leader. If you judged me solely by my work life, this would almost certainly be true. However, aside from my work there was nothing in my life that I enjoyed. My work became so ingrained in who I was that I forgot how to enjoy anything else. I actualized the dreams I envisioned for myself without leaving room for anyone else. Reflecting on my life now, I realize all of the success I had was meaningless, because the most important part of what you do is who you do it with, and at the end of it all, I had no one. Life is a series of choices, and the choices you make determine your reality. But when too many choices favor work over family, favor intellectual pursuits over love, you lose that which matters most, and any hope of being happy. I was never able to find the silver lining between work life and family life. I was too willing to sacrifice bedtime stories for presentations and anniversaries for meetings. And the more time I spent away from my family and friends, the more I taught them to live without me. In this way, I failed as a father and as a husband. That is my greatest regret. I got so lost in my obligation to be a mechanism of positive change that I forgot to enjoy the journey. Leadership is about balancing that which we value. Leadership is about maximizing the utility, joy, and meaning of the lives around you while doing the same for yourself. You cannot have one without the other. I wish I could be there now to tell them that, if I could rewrite my life, I would leave a different legacy. I would read them a poem read to me at my high school graduation, one I read as a best man. A poem that’s essence knows boundless wisdom, that’s essence I grew away from until the day I passed.